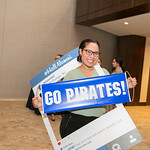 The sound of beating drums, lively dancing, applause and laughter filled Bethany Hall on October 15, 2018. 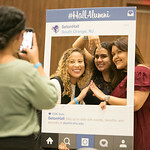 The long colorful skirts of swirling dancers and the rhythm of Bomba and Plena mesmerized alumni who had gathered to celebrate the closing reception of Hispanic Heritage Month at Seton Hall. 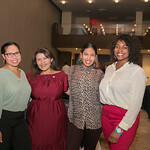 The performance by Segunda Quimbamba, a Puerto Rican folkloric group from Jersey City, NJ, got the audience cheering and even out of their seats onto the dance floor. In between songs, the group shared the history and legacy of Bomba and Plena, percussion-driven musical traditions dating back hundreds of years from the island of Puerto Rico. 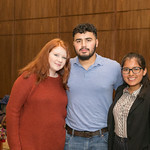 This festive, fun-filled night was organized by the Seton Hall Adelante Latino/a Alumni Club and the University's office of Alumni Relations & Annual Giving, supported by students of Adelante Student club and the Joseph A. Unanue Latino Institute. 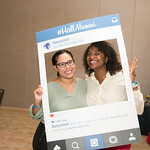 Hispanic Heritage Month has been celebrated, in the United States, every year from September 15th to October 15th since 1988. September 15th was chosen as the day marking the beginning of the celebrations because it commemorates the independence of five Latin American countries: Costa Rica, El Salvador, Guatemala, Honduras and Nicaragua. Additionally, Mexico observes its Independence Day on September 16th. 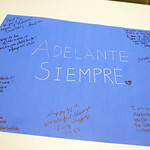 The month aims at celebrating Hispanic and Latino American culture and history. 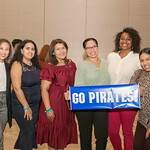 Adelante Alumni Club Ambassador Yessenia Sanchez-Mercedes '10, the evening's emcee, passionately called upon her fellow Pirates to demonstrate one-hundred percent participation by making a gift, of any amount, to support the student organization. 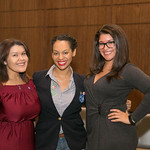 The Adelante Latino/a Alumni Club is comprised of alumni who were involved as a student with, or share an affinity for, the Adelante Latino/a Student Organization and the Latino/a community at Seton Hall. 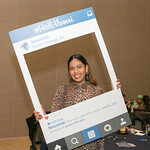 The event provided alumni the opportunity to connect with and write words of encouragement to current students, as well as reconnect and reminisce with old friends over mojitos and hors d’oeuvres. 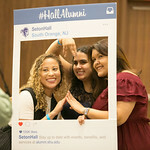 "The night was a great success and a vibrant celebration of heritage and the rich Latino/a community here at Seton Hall," said Brian O'Malley, director of alumni clubs at Seton Hall. 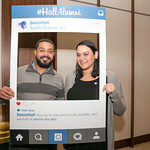 Alumni interested supporting students of the Adelante Latino/a Student Organization at Seton Hall, or attending an upcoming event are encouraged to visit www.shu.edu/Adelantealumni.